With the arrival of the New Year, NEEP said good-bye and farewell to the DesignLights Consortium, which began 2017 as an independent organization. Led by its own Board of Directors with Tina Halfpenny as Executive Director, the DLC team of eight professionals across the U.S. continues the DLC’s key market transformation role to set the bar for and distinguish quality, energy efficient commercial lighting products. The DLC is an outstanding example of how the energy efficiency leadership of Northeast and Mid-Atlantic states can help drive market transformation on a national and international scale. In 2008, energy efficiency programs across the region saw that LED products – mostly streetlighting – had emerged as market-ready products and were getting market attention. With the potential for significant energy savings, superior lighting performance and control, and product lives of 10-20 years, the initial wave of LED products was recognized as a great opportunity. Efficiency programs in New York and New England saw this as the beginning of a tremendous opportunity to achieve their energy savings goals set by state policymakers and utility regulators. At this early stage of market introduction, efficiency program administrators also recognized the need to distinguish high performing, no-regrets products from lesser quality, less efficient products. Building on prior successful regional collaboration through NEEP’s DesignLights Consortium to accelerate quality, efficient commercial lighting products and design, Northeast efficiency programs asked NEEP to use the consortium to develop product specifications and a list of qualified, compliant products that efficiency programs could reference in their incentive and rebate programs to accelerate market adoption. Informed by the success of the Energy Star program for consumer products, in 2009 NEEP published the first DLC LED qualified products list. Within months, efficiency programs across the country asked to participate and use the DLC LED Qualified Product List. Likewise, manufacturers across the country took note of this resource to distinguish products eligible for energy efficiency program incentives. Within two years, in close collaboration with efficiency programs and dialogue with the lighting industry, the DLC had developed 15 product specifications and a qualified products list exceeding 300 products. Since then, the DLC has become the leading label in the U.S. and Canada for quality and efficiency commercial lighting with over 250,000 listed products from over 1700 manufacturers from across the world. The DLC is supported, referenced and used by 84 efficiency programs across the US and Canada. It is also referenced by manufacturers in Asia, Europe and South America. Continuing to respond to the needs of efficiency programs across the region to increase energy savings, NEEP and the DLC launched another commercial lighting project. In 2013, with the support of a grant from the U.S. Department of Energy, a new project was born. This project was designed to advance energy savings opportunities through Commercial-sector Advanced Light Controls (CALC) by conducting in-field performance testing of LED lighting control products, and to, again, distinguish quality, efficient products while encouraging interoperability of lighting control systems with whole building energy management systems. While providing information and tools needed to include advanced lighting controls to achieve deep energy savings, this, too, is setting the bar nationally for the introduction of high-efficiency commercial lighting products. 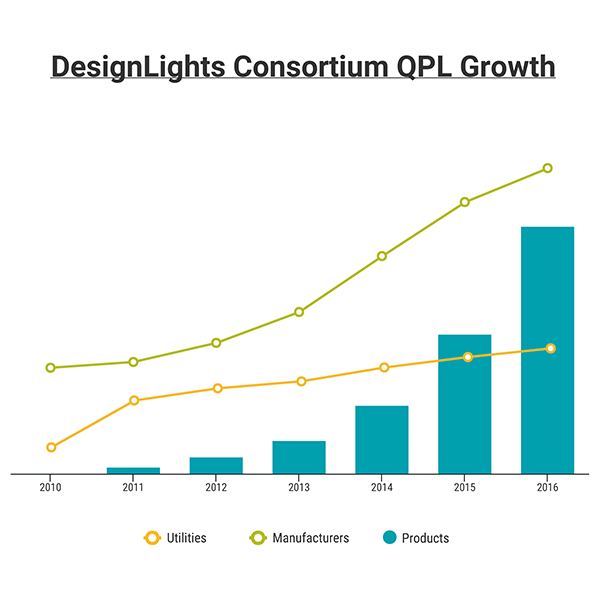 With this growth, the early ripple of the DLC to serve the needs of efficiency programs in the Northeast-Mid-Atlantic region has helped to build a wave of quality, efficient LED products nationally and internationally. We are proud of the leadership of the Northeast states and energy efficiency programs to help drive a still-unfolding market transformation of efficient, quality LED lighting, and of the successful and continuing regional and national collaboration that has made the DLC a leading guide for what is arguably one of the greatest market transformation success stories yet.